An American developer with serious Metal Gear cred. The production studio that made that MGS4's wild intro movies. Looking at the upcoming stealth game they're collaborating on you could get the idea that this is just another Metal Gear Solid type game. You'd be wrong. The game follows a young girl named Hope who is being held captive in a mysterious totalitarian state. Using a contraband phone, she calls you and asks for help. Hope isn't a puppet, and sometimes she might even disagree with you—that is, if you tell her to do stupid things. You goal is to not only help her, but also protect her. This is République. Via her contraband cell phone, you can hack into the state's surveillance network and help her escape. You can tap on in-game cameras to "warp" into them and see the room and spaces from different points-of-view. The game doesn't feature any killing, and Hope can use only the limited supplies she finds. "The game is all about voyeurism, paranoia, censorship and control," said developer Ryan Payton. Payton first made a name for himself during the development of Metal Gear Solid 4, while California-based Logan was responsible for the inventive opening films. Both are joining forces for République. Payton was one of the team members pushing for streamlined MGS4 controls. For République, he wants to do the same thing for the iOS. "I refuse to play anything on iOS with a virtual joystick," said Payton. "So from day one, it was our goal to develop an action game with controls specifically designed for touch-based devices." "The game is all about voyeurism, paranoia, censorship and control." Stealth games and survival games typically have complex controls, but Payton and Logan have stripped the game down to its essence. The result is experience that is controlled through intuitive motions: touch, swipe, and pinch. From the get go, former Kojima Productions dev Ryan Payton, who recently set up his own studio Camouflaj, challenged his team at Logan to come up with gameplay that did not revolve around killing. "In a very organic way, the gameplay shifted towards stealth," Payton recently told Kotaku. "This initially worried me because I didn't want people to think that the game was paying homage to Metal Gear." 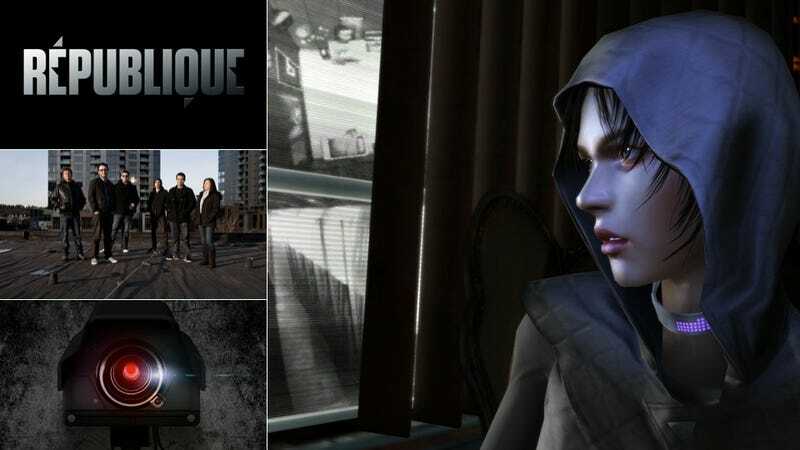 Instead, the resulting concept for République seems to owe more to the original Resident Evil and the Parasite Eve games—hence why Payton is calling it "stealth survival". Sure, Metal Gear is an influence—give years of your life to a franchise and influences will carry over—but Payton and Logan were interested in how they could also incorporate modern games like Portal and Dark Souls as well as novels like Brave New World, We, and 1984 to create a stealth experience like you've never played before. République is currently in its proof of concept phase. It's currently for iOS, and a playable demo exists, but it's still early in the title's life. Savings, generosity, and sheer sweat have funded the title this far, and a Kickstarter campaign will launch to help finish it. "In a very organic way, the gameplay shifted towards stealth." While Payton has several high profile games under his belt, this is the first title Logan has developed. The studio has made a name for itself with inventive commercials and cinematics, but was looking to spread its wings into game development. Since the studio and Payton go back to the Metal Gear 4 days, this seemed like an ideal fit. The concept for République was originally Payton's, but Logan saw something that appealed to its sensibilities. According to Logan co-founder Alexei Tylevich, "A dystopian sensibility is something that I normally tend to gravitate toward, and I feel that the concept behind this game is a perfect fit for Logan." Making a truly immersive world is something Tylevich has always wanted to do. Payton and Logan are aiming to make an experience that pulls them in with game play and then digs its claws into them with its ideas and characters. "Without being preachy, the goal with République is to transport players into a world heavily inspired by the debate going on right now about SOPA, surveillance, digital rights, the Fourth Amendment...the stresses and white noise of living in a digital age," said Payton. "My desire is that the game touches players on an emotional and intellectual level."